Rome, Italy, Apr 8, 2010 / 10:27 am (CNA/EWTN News).- The Holy Shroud was transferred from Turin during World War II to keep it out of reach of Adolph Hitler, according to a Benedictine priest in a southern Italian abbey. Monks in Avellino, Italy stored the relic until 1946 "officially to protect it from bombs, in reality to hide it from the Fuhrer, who was obsessed with it," the monk said. Sensing the dangers posed by German officials' interest in the Shroud during a visit from Hitler to Italy in 1938, the following year the Vatican and the royal Savoy family decided to move the unique and revered cloth bearing the likeness of Christ to a locale offering more safety than the Cathedral of Turin. Father Andrea Davide Cardin, rector of the library of the Benedictine abbey of Montevergine, told Italy's Diva e Donna magazine that the "unusual and insistent questions" from the Nazi hierarchy put the Church and the royal family "on alert." King Umberto II of Savoy, whose family had owned and protected the Shroud since the 15th century, thought that the Vatican was the only place it might be safe, while Pope Pius XII was inclined to send it to Montecassino for hiding, related Fr. Cardin. In the end, the decision was made to store it with the Benedictines in the town of Avellino, more than 500 miles from Turin in the southern region of Campania. The decision was fortuitous as the monastery at Montecassino was later destroyed by Allied bombing meant to dislodge a Nazi stronghold there. Fr. Cardin described the great secrecy with which the operation was carried out in Sept. 1939. The Shroud was secretly transported from Turin by way of Rome, to be placed below an altar in the abbey under the cover of night. The secret was kept throughout the war despite a search of the premises carried out by German soldiers in 1943 following a bombing of Avellino. The relic was protected, said Fr. Cardin, as, upon hearing of the coming of the soldiers, the monks retired to pray at the altar. "An officer," he explained, "seeing them in prayer, gave the order not to disturb (them) and that was how the sacred relic went undiscovered." Hitler apparently sought the linen for its "sacred power." 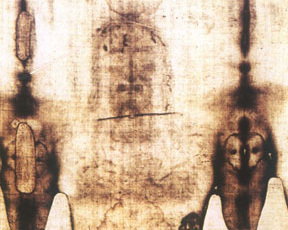 The Shroud will be exposed to the public from this Saturday until May 23 at the Cathedral of Turin, to which it was returned in 1946. Among the more than one million visitors that will see the ancient linen during the next month is Pope Benedict XVI. He will visit the northern Italian city and the Shroud on May 2.